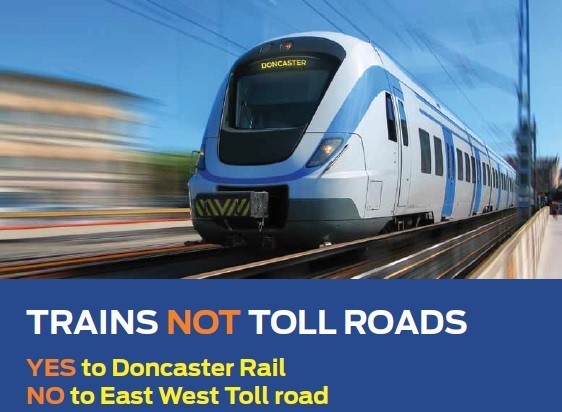 The Coalition of Transport Action Groups (CTAG) are holding a public rally to protest against the proposed East-West Link for Melbourne, on the steps of the Victorian Parliament on Tuesday August 20th, starting at 12.45pm. 2. The second reading and debate in the Legislative Assembly (lower house) of the State Government’s Major Transport Projects Facilitation Amendment (East West Link and Other Projects) Bill 2013 will occur on this day. This is a crucial moment in the campaign to stop the construction of the East-West Link, which will set Melbourne on the road to increased traffic congestion and put the construction of the much-needed Doncaster Railway back by 30 years, not to mention the destruction of the parklands and communities in the Toll Road’s path. For more information about the Trains Not Toll Roads campaign, visit the Yarra Campaign for Action on Transport.